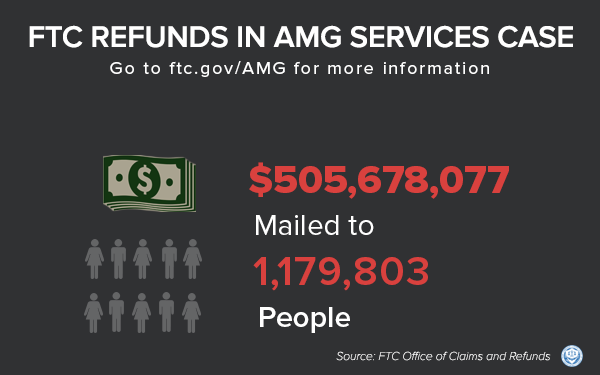 The Federal Trade Commission, working jointly with the U.S. Department of Justice, is mailing 1,179,803 refund checks totaling more than $505 million to people who were deceived by a massive payday lending scheme operated by AMG Services, Inc. and Scott A. Tucker. The consumer refunds stem from a record-setting $1.3 billion civil court judgment and order the FTC obtained against Tucker and his companies for violating the FTC Act and the Truth in Lending Act when they deceived consumers across the country and illegally charged them undisclosed and inflated fees. The order represents the largest litigated judgment ever obtained by the FTC. In its 2012 complaint, the FTC alleged that the operators of AMG Services, Inc. falsely claimed they would charge borrowers the loan amount plus a one-time finance fee. Instead, the defendants made multiple withdrawals from consumers’ bank accounts and assessed a new finance fee with each withdrawal. As a result, consumers paid far more for the loans than they had originally agreed to pay. In 2017, the United States Attorney’s Office for the Southern District of New York obtained criminal convictions against Tucker and his attorney, Timothy Muir. In 2018, they obtained a sentence of more than 16 years in prison for Tucker, and a penalty of $528 million against U.S. Bancorp for violations of the Bank Secrecy Act, including failing to timely report suspicious banking activities of Tucker. The FTC and U.S. Attorney’s Office also obtained settlements in January 2015, November 2015, February 2016, and June 2018 with three Native American tribes involved in Tucker’s operation. The FTC and Department of Justice are jointly using funds obtained in the civil and criminal matters to provide refunds to consumers who took out loans before January 2013 from the following seven loan portfolios serviced by AMG Services: 500FastCash, Advantage Cash Services, Ameriloan, OneClickCash, Star Cash Processing, UnitedCashLoans, and USFastCash. Recipients should deposit or cash checks within 60 days, as indicated on the check. Rust Consulting, Inc., the refund administrator for this matter, will begin mailing refund checks today. The FTC and the administrator have used the defendants’ business records from January 2008 through January 2013 to identify consumers and calculate their refund amounts, so it is not necessary for these consumers to contact the FTC to make claims. The FTC never requires consumers to pay money or provide information to cash refund checks. Consumers who borrowed from one of the listed portfolios before January 2008 or who otherwise have questions should call 1-866-730-8147.